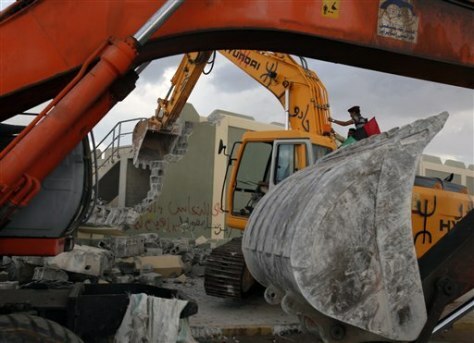 Revolutionary fighters use heavy machinery to tear down a guard tower at the Bab al-Aziziya compound in Tripoli, Libya, Sunday, Oct. 16. Ahmad Ghargory, the commander of a revolutionary brigade, says forces had been busy with the war but now it's time "to tear down this symbol of tyranny." He says the area will be turned into a public park. The compound has long been seen as the symbolic heart of Gadhafi's rule.